Designed for the contractor and embraced by the homeowner. the edging and nail spikes secure on your project over time. Which one is right for your application? 6 inches for the nylon stake application. 9 inches for the galvanized stake application. The thickness of the setting bed must be between 0.625” – 1” (15mm - 25 mm). The thickness of the paver must range between 1.5" – 2.75" (38mm - 70 mm). Use a trowel to completely remove the setting bed material away from the paver so the top of the aggregate base is exposed. For curved applications, simply cut the rigid connection strips prior to installation. The edging is designed to snap easily together and can be done prior or during the installation process. Place the edging firmly against the pavers and on top of the aggregate base. Drive the nail spike all the way in and continue. There is an angle built into the edging that will help direct the nail into the proper position for maximum strength. 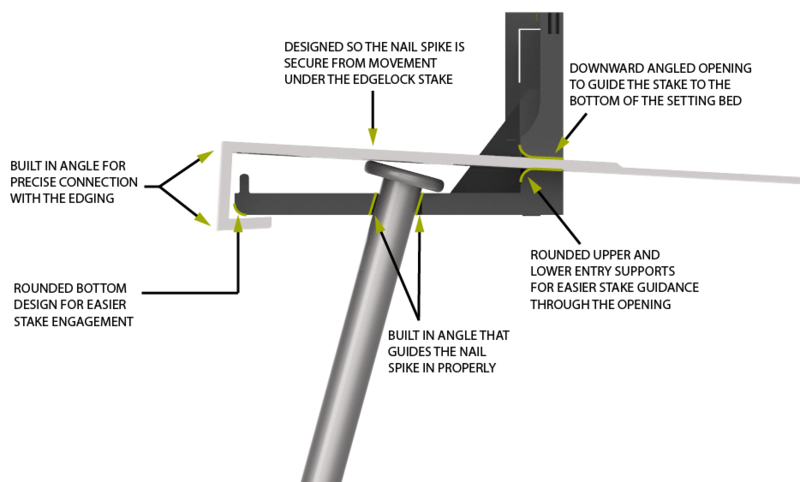 Edgelock stakes are designed to be placed over each nail spike. Before inserting the stake, position it at the appropriate angle (see figures 1-4) ensuring that it crosses a minimum of 1 or more paver joints. Insert the stake into the opening of the edging and simply push in as far as you can by hand. Then use a hammer to tap the stake in completely so the return of the stake engages with the edging. For nylon stake applications, bend the stake into the opening and follow the steps in 3A to complete the installation. Backfill over the edging to finish grade. Fill in the pavers with jointing sand and compact. ​Take the linear feet of the perimeter to be edged and divide by 4 to get the total number of Edgelock strips needed. Count each edging start and stop point in the project and divide the total number by 2. See Figure A below. I. 80 LF ÷ 4 = 20 Edgelock® Strips. II. 20 Edgelock® Strips x 3 = 60 Edgelock® Stakes. III. Start and stop points: 8 ÷ 2 = 4 additional Edgelock® Stakes. ​Insert the stake straight to cross multiple joints. ​Insert the stake at an angle to cross multiple joints. ​Insert the stake at an angle if able to cross a joint, try to cross as many joints as possible. If unable to cross a joint insert stake straight. ​Cross as many joints as possible, stakes may overlap at corners. 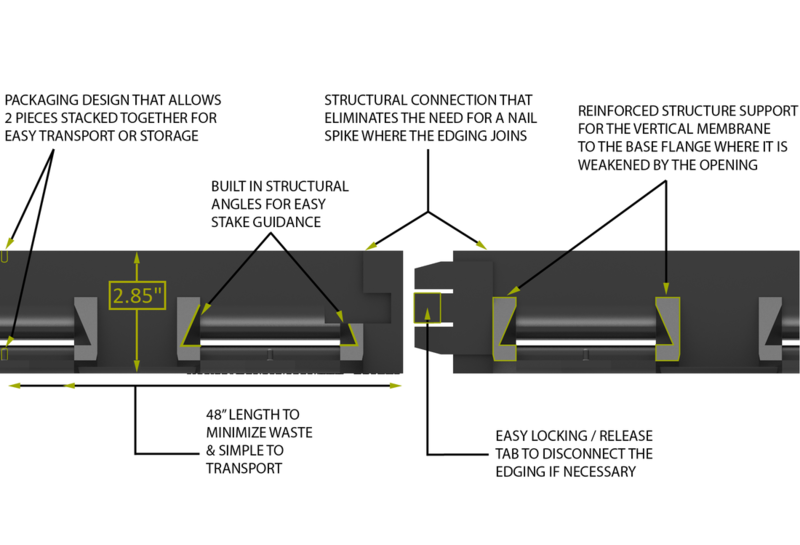 For radius applications, simply cut the rigid connection strips prior to installation. The edging is designed to snap easily together and can be done prior or during the installation process. Insert the stake straight next to a wall or driveway and then continue with the normal installation guidelines. "I was blown away at how easy it was to install!"